I finished Wonder Woman Vol. 6: Bones, the final volume of Brian Azzarello and Cliff Chiang's superb run on the title, both impressed and a little let down. This is a worthy finale, suspenseful and shocking and action-packed. At the same time, one of my complaints about the fifth volume still stands, that as much as Azzarello packs in here, there's still quite a bit more I wish Azzarello would have addressed. Ultimately, that I'm left wanting more must be another positive sign of this run's accomplishments; I wholly expect a deluxe or omnibus edition of these issues is coming down the pike and that'd be an epic collection indeed. It's a rare and wonderful thing these days when I'm able to avoid spoilers on the internet, and I was delighted in finishing Bones to be wholly blindsided by the revelation about the goddess Athena. Given the omnipresence of the other gods in this story, Athena's absence has been conspicuous for a while (despite a brief appearance in the Zero Month issue). But like any good mystery writer, Azzarello obfuscated the truth in other, reasonable theories; we had no reason to think Zola was Athena and that her child Zeke was Zeus because Azzarello had already assigned them the role of the god-hunted quarry in the book. The revelation brings the story nicely full circle, in that nothing from the revelation of Wonder Woman's parentage to the rise of the First Born and his ultimate defeat was accidental, so much as everything unfolded in the end exactly according to plan. Another red herring as to Zola being Athena is the cover of this book's final issue, which shows Zola in a tank top reminiscent of former Wonder Girl costumes. In the first chapter, however, I think Azzarello lays out what is Zola's real thematic resonance in the book, when Wonder Woman Diana refers to Zola jokingly as "mother." But in fact what Diana has come to understand through these six volumes is that her mother Hippolyta's lie that Diana was born of clay rather than sired with Zeus was not an act of betrayal, but rather an attempt to keep Diana safe from the jealous goddess Hera. This has been the mission forced on Zola since this title's beginning, and in the end when Diana pleads with Athena for Zola's distinct life, it seemed to me she was pleading not for a sidekick or little sister, but for her own ensorcelled mother. And yet, this is one area where at the same time Azzarello does not satisfy, in the question of Diana and her mother Hippolyta. To great effect, Zeke resurrects Hippolyta, turned to stone by Hera, as a golem, but the action soon leaves Paradise Island for Olympus, and Hippolyta is never seen again. The audience intuits, by Diana's defeat of the First Born, that the mad god's armies have been routed on the island, but as to whether Hippolyta is made flesh, remains a golem, or turns back to a statue is never shown. Grant Morrison teaches us the three essential words of comic books are "to be continued," and maybe this is a mystery that'll be solved in Meredith Finch's debut issue that follows, but it seemed to me a facet of Azzarello's story left unfinished. In my review of Wonder Woman Vol. 5: Flesh, I complained that though Azzarello makes Wonder Woman the God of War, he never shows how being a "god" is any different than Diana's life might be otherwise. 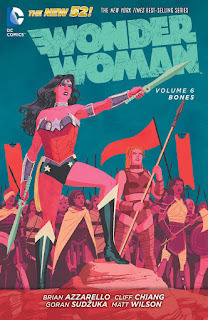 Further, early on Azzarello revealed that Diana can call upon enhanced demigod powers to fight her enemies, controlled by the wearing or removal of her arm gauntlets, a fact on which the climax of Bones turns; however, nowhere in these six volumes has there been any explanation of what this power is, how Diana learned about it (and what she thought it was prior to understanding her own divine origins), nor why Diana hesitates to use this power until very, very late in this book, even after what seems to be a critical defeat. Nor, for a story that was meant to be Wonder Woman's "origin" in the New 52, was Athena's connection to Diana ever spelled out (except in a Secret Origins story collected here as an epilogue), making this a story that incongruously can only really be enjoyed by an audience with some foreknowledge of the Wonder Woman mythos. Azzarello has never shied in this run from taking the Amazons into controversial and even sexually-difficult territory, something I haven't minded so much if nothing else but for the daring of it (see also Judd Winick's Catwoman Vol. 1: The Game). That continues here; after positing the Amazons as "black widows" who mate with and then kill men, and then send their male babies to death or exile, Azzarello then has Diana reproach the Amazons for their behavior, exhorting them to work alongside their Amazon brothers. In a story about aliens that mistreat other aliens, this would be a natural and thematically correct comeuppance; in the wake of "Gamergate" and etc., however, a male writer having Wonder Woman shame the ultimate female-led society for not letting boys in their clubhouse is problematic. I don't actually think Azzarello intends such, but that rather this is a point about how old societies need to grow and change (or, if you tilt your head and squint just right, the Amazons are the misogynists in this metaphor, somehow). Still, it will be interesting to see, along with the fate of Hippolyta, how future writers utilize, or don't, this idea of male and female Amazons sharing an island together. But again, none of this is a critique so much as a celebration of Brian Azzarello's Wonder Woman, which is dense enough to invite this kind of consideration when so many of its ilk are not. If Wonder Woman Vol. 6: Bones does not satisfy on every level, it's still an epic ending to one of the undisputed gems of the now-ending New 52. Azzarello and Cliff Chiang have assuredly left big, star-spangled boots for the next team to fill. The Finch run that follows sort of deals with what happens to Hippolyta but mainly focuses on the male female Amazon conflict and does an admirable job at expanding on Azzarellos run in my opinion. For me the story reaches a full circle with this book. The "Who?" in WW#35 is detailed in WW#Secret origins, which leads into WW#1. And more importantly (for me), Diana telling Athena how important Zola is to her in WW#35 is contesting Zola's views in WW#1 about herself, saying her life isn't important. About Hippolyta, I reckon she is another victim of the irony of the gods, the one that Diana is "born of clay". While stuff happens in Finchs story, for me she stays a living statue and Diana queen. This while Zola nurtures the new Zeke (matriarchy) under the watch of the amazons. About Diana's powers. Does it matter much? The one she tries to make use of is her head and heart, even if too much at times. Holding back on her powers too much. Which is noble. Same thing with her being the God of war. she uses it to rally her sisters towards war (and reformation) with the ultimate man macho monster. An interesting thing the book does is play with duality. Everything from the gods using Raise/Raze in the same sentence, to pairing up the GOD of war with the DOG of war. A warrior of peace, who fights with love becoming the god of war. Zeus being the ultimate man, but also revealed to have been a mother. Stuff like that, it's all over the book. And one significant one is the use of men and women, as vessels. Men seed vessels, women baby vessels. Which is made into a point in both WW#7 (with the raids) and WW#35 (Diana pleading for Zola). I'v actually brought this up with a couple of friends, and they got quite stunned by it. So I think the point is a good one. I'm thinking Scott Snyder perhaps will come up with a WW story after he's "done" with Batman by issue 50. Azzarello and Chiang have also said that they have another WW story in them, so we'll see. I appreciate your comment and your deep thoughts on the run. I was trying to place how the persistent homophones in the book tied thematically into the run, and your idea of duality is very good. I didn't see Zeus as a mother necessarily, but I understand him as the ultimate man and then, later, the ultimate child. I can't say I agree about Diana's powers. When a major struggle in the book is when to, or not to, use those powers, and those powers are totally new to the character and the audience (though not new, in story, to Diana herself), then I think the audience needs to be clued in. Otherwise we can't participate dramatically in Diana's struggle if we don't understand the stakes. But again, this is a book worthy of examination; thanks for sharing.